With the proliferation of digital technologies, enterprises are striving to stay ahead of the complexity of threats across multiple vectors, and the need for real-time prevention has never been greater. 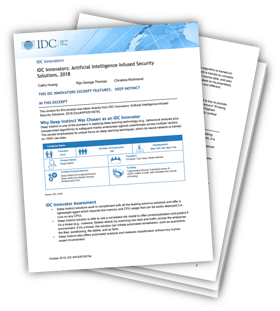 In IDC’s recent report: “IDC Innovators: Artificial Intelligence–Infused Security Solutions, 2018” IDC selected leading emerging cybersecurity vendors that have an innovative new technology or a groundbreaking business model that are changing the defense landscape, and Deep Instinct is proud to be part of it. Download the report and learn how and why Deep Instinct was selected as an emerging cybersecurity vendor that’s using AI technologies to combat cybersecurity.